What is the difference between olive oil and other vegetable oils? What is the difference between olive oil made in the U.S. and imported oils? As of yet, there is no certification done on imported oils, so a majority of them aren’t good quality and not truly “Extra Virgin” as the label implies. 69% of the extra virgin olive oil sold in the United States is adulterated or fraudulently labeled. We offer our product with 100% honesty and from the heart – from our family to yours. What does Extra Virgin, Virgin, etc. mean? “Extra Virgin” is top-quality virgin oil that has a natural acidity (expressed by oleic acid) of 0.8% or less. Furthermore, it has to be certified by a panel that assesses the olive oil’s organoleptic (taste and aroma) characteristics and verifies that it doesn’t contain any defects. Cold pressed simply means that no significant heat was added during the pressing process. By radically raising the temperature of the paste (over 30°C/86°F), the oil extraction yield can be increased. Using too much heat, however, damages the oil; this technique is used where quantity is more important than quality. By definition, all “extra virgin” olive oils must be cold pressed, but we still mention this on our label to indicate that no heat was added during the extraction process. How long does olive oil stay fresh on the shelf? Ultra-premium Extra Virgin Olive Oil (EVOO) can last for a few years because of its high antioxidant properties. However, unlike wine, most olive oils are best used in the year of harvest, as taste and aromatic characteristics are likely to diminish after that. It will last longer if it’s stored in a dark place away from excess heat. All good oils should clearly state a “best before” date, so be sure you check this before purchasing. What determines whether an olive oil will be extra virgin? An olive oil should be “extra virgin” if it is pressed by a clean machine from healthy, undamaged, freshly picked olives. Do you use only Texas olives in Salud de Paloma? Texas olive growers do not currently have enough production capacity. 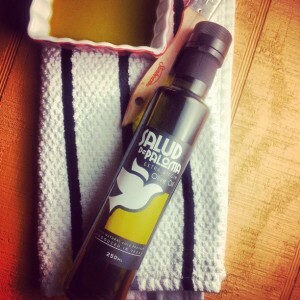 Salud de Paloma uses a blend of Texas and California olives to keep up with the demand for our healthy olive oil product. Why do you use green glass bottles for Salud de Paloma? We specified green glass to protect the olive oil from light. Our 100% recyclable bottle has a smooth finish, clean modern lines, and simple radius curves, which make it a joy to hold and pour. Where do you produce Salud de Paloma olive oil? Our olive milling, bottling and distribution center is in Dripping Springs, Texas. We collaborate with The Texas Hill Country Olive Oil Company for our olive oil production. No, none at all! So go ahead and enjoy…¡buen provecho!